Well done, good and faithful servant … enter thou into the joy of thy lord. COOPERSTOWN - Father John R. Roos, 86, of Cherry Valley, entered into eternal rest Tuesday night, January 3, 2017, at St. Elizabeth Medical Center in Utica following a brief illness. He was born January 5, 1930, in Albany, a son of the late Frank and Katherine (Purcell) Roos. A graduate of Vincentian Institute, Father was ordained to priesthood on July 17, 1955 (The Feast of Our Lady of Humility) at the Church of Twelve Apostles in Rome, Italy. His first assignment was at The Cathedral of the Immaculate Conception in the City and Roman Catholic Diocese of Albany. He completed graduate studies at Catholic University in Washington, D.C. where he studied canon (Church) law and served as Secretary the Diocesan Tribunal. He later taught and was Rector at Mater Christi Seminary in Albany. His entry into Parish Priesthood began as Pastor of St. Joseph's Church in Scotia. He served on brief temporary loan to the Archdiocese of Anchorage, Alaska, then returned to his native New York State and served as Pastor of St. James Church in Fort Plain and Annunciation Church in Ilion. Upon the retirement of Fr. John Sise in 1991, Fr. Roos was named pastor of St. Mary's "Our Lady of the Lake" Roman Catholic Church in Cooperstown. One of his first acts was to appoint a Parish Council to assist with Church spiritual, social and economic functions. Later in his ministry it was under his guidance that the Eucharistic Minister program at Bassett and the St. Mary's Bereavement ministry was begun and flourished. He retired June 30, 2000, and went on to serve as Sacramental Minister at St. Thomas the Apostle in Cherry Valley, Blessed Sacrament in Springfield Center and St. Mary's in Sharon Springs. He resided for a time in Cobleskill and more recently made his home at the Clara Welch Thanksgiving Home in Cooperstown. On June 14, 2015, he celebrated his 60th (Diamond) Anniversary of Ordination to the Priesthood in the company of the Reverends John P. Rosson and Andrew W. Cryans (who celebrated their Ruby Anniversaries) and Rev. Gregory Weider in a Mass of Thanksgiving at St. Mary's "Our Lady of the Lake" Roman Catholic Church in Cooperstown. Fr. Roos once stated, "There's a quote I've always liked: If Jesus is for real, things fit. Without Him, nothing makes any sense at all." 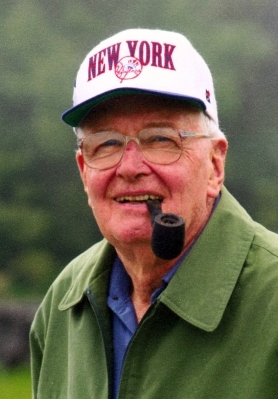 An avid fan of the New York Yankees, he equally enjoyed Notre Dame and Syracuse University athletic events. He loved to sing -- his chanting during Mass was always impressive and meaningful -- and at various times he could often be heard humming to himself. He also had a passion for chocolate, enjoyed corned beef sandwiches, pansies, smoking his pipe, and reading. He always enjoyed talking with friends and family and appreciated the visits, gifts, cards and calls throughout his life from parishioners and friends far and wide, especially in the last weeks of his life. Fr. Roos will be fondly remembered by many faithful parishioners for his kind, understanding, humble and calming presence. He was preceded in death by his brother, Father Robert E. Roos, who died October 1, 2003. Fr. Roos is survived by his brother, Joseph F. Roos and wife, Ann, of East Syracuse, and is the uncle of Joseph F. Roos, Jr. and wife Jennifer and their sons, Ryan, Sean and Evan of Fayetteville. Many cousins and friends and his extended church family survive him. The Liturgy of Christian Burial will be celebrated at 11 a.m. on Tuesday, January 10, 2017, at St. Mary's "Our Lady of the Lake" Roman Catholic Church in Cooperstown. The Most Reverend Howard J. Hubbard, D.D., Bishop Emeritus of Albany will celebrate the Mass. The Reception of the Body will be at 4 p.m. on Monday, January 9, 2017, at St. Mary's "Our Lady of the Lake" Roman Catholic Church in Cooperstown, where he will lie in repose and people may pay their respects until 7 p.m.
Vespers will be held Monday evening at 7 p.m. at the Church. The Service of Committal and Burial will be in Our Lady of Angels Cemetery, Colonie, where Fr. Roos will be laid to rest in the family plot. Arrangements are under the care and guidance of Peter A. Deysenroth and Martin H. Tillapaugh, Funeral Directors.